A few years ago I took up the idea of building my own Hurdy Gurdy. Now I’m not much of a craftsman, so that might be a disadvantage. I am, however, a highly experienced mechanical engineer. My normal field is designing equipment for the high-tech industry, with customers around Europe, Japan and Silicon Valley in the US. 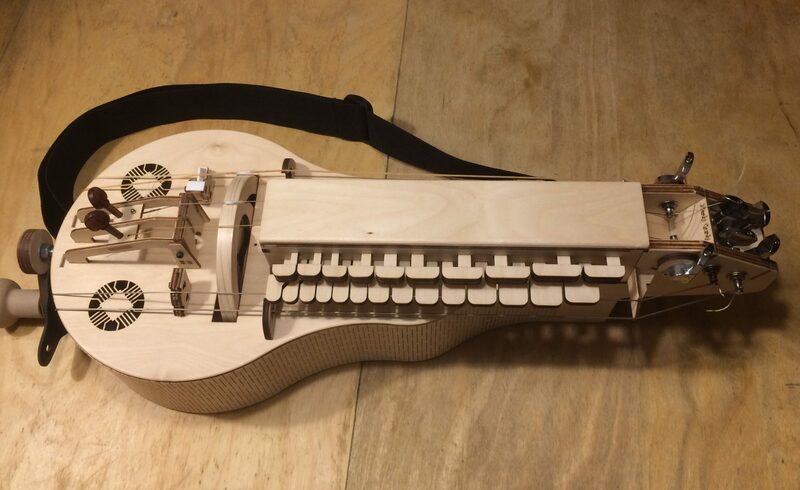 So I thought: why not use the tools of the trade, and create a Hurdy Gurdy using modern rapid prototyping technology: Laser Cutting and 3D printing? Would it be possible to create an instrument that is inexpensive to build, and still sounds well? I’ve worked on it for 4 years before releasing it into the wild. I’ve named it the Nerdy Gurdy, because it’s high-tech and a bit quirky. Since it’s inception a number of traditional builders, and some of the best hurdy gurdy players in Europe have tested it and helped to improve it. The design is unconventional: it was designed from scratch to be able to build a Hurdy Gurdy with an acceptable sound, for a very good price. Therefor the construction method is in many ways different from traditional instruments. It does however sound quite good, and it is very playable. My wife Fay has taken up the challenge of shipping kits and instruments around the world. I build instruments when I have time, and work on further Nerdy Gurdy improvements (next to my regular job as Mechatronic System Architect).